Wine making has been around for thousands of years. In its basic form, wine production is a natural process that requires very little human intervention. Mother Nature provides everything that is needed to make wine; it is up to humans to embellish, improve, or totally obliterate what nature has provided, to which anyone with extensive wine tasting experience can attest. There are five basic stages or steps to making wine: harvesting, crushing and pressing, fermentation, clarification, and then aging and bottling. Undoubtedly, one can find endless deviations and variations along the way. In fact, it is the variants and little deviations at any point in the process that make life interesting. They also make each wine unique and ultimately contribute to the greatness or ignominy of any particular wine. The steps for making white wine and red wine are basically the same, with one exception. The making of rosé wines and fortified or sparkling wines is also another matter; both require additional human intervention to succeed. Learn more about wine and what goes into every bottle by reading our wine glossary index. 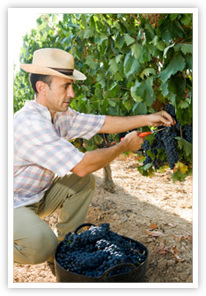 Harvesting or picking is certainly the first step in the actual wine making process. Without fruit there would be no wine, and no fruit other than grapes can produce annually a reliable amount of sugar to yield sufficient alcohol to preserve the resulting beverage, nor have other fruits the requisite acids, esters and tannins to make natural, stable wine on a consistent basis. For this reason and a host more, most winemakers acknowledge that wine is made in the vineyard, at least figuratively. The process of making fine wine requires that the grapes are harvested at the precise time, preferably when physiologically ripe. A combination of science and old-fashioned tasting usually go into determining when to harvest, with consultants, winemakers, vineyard managers, and proprietors all having their say. Harvesting can be done mechanically or by hand. However, many estates prefer to hand harvest, as mechanical harvesters can often be too tough on the grapes and the vineyard. Once the grapes arrive at the winery, reputable winemakers will sort the grape bunches, culling out rotten or under ripe fruit before crushing. 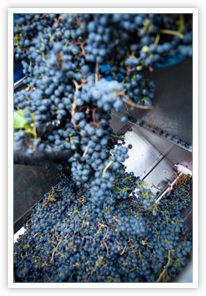 Crushing the whole clusters of fresh ripe grapes is traditionally the next step in the wine making process. Today, mechanical crushers perform the time-honored tradition of stomping or trodding the grapes into what is commonly referred to as must. For thousands of years, it was men and women who performed the harvest dance in barrels and presses that began grape juice's magical transformation from concentrated sunlight and water held together in clusters of fruit to the most healthful and mystical of all beverages - wine. As with anything in life, change involves something lost and something gained. By using mechanical presses, much of the romance and ritual has departed this stage of wine making, but one need not lament too long due to the immense sanitary gain that mechanical pressing brings to wine making. Mechanical pressing has also improved the quality and longevity of wine, while reducing the winemaker's need for preservatives. 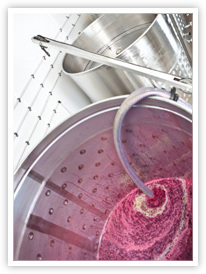 Having said all this, it is important to note that not all wine begins life in a crusher. Sometimes, winemakers choose to allow fermentation to begin inside uncrushed whole grape clusters, allowing the natural weight of the grapes and the onset of fermentation to burst the skins of the grapes before pressing the uncrushed clusters. Up until crushing and pressing the steps for making white wine and red wine are essentially the same. However, if a winemaker is to make white wine, he or she will quickly press the must after crushing in order to separate the juice from the skins, seeds, and solids. By doing so unwanted color (which comes from the skin of the grape, not the juice) and tannins cannot leach into the white wine. Essentially, white wine is allowed very little skin contact, while red wine is left in contact with its skins to garner color, flavor, and additional tannins during fermentation, which of course is the next step. Fermentation is indeed the magic at play in the making of wine. If left to its own devices must or juice will begin fermenting naturally within 6-12 hours with the aid of wild yeasts in the air. In very clean, well-established wineries and vineyards this natural fermentation is a welcome phenomena. However, for a variety of reasons, many winemakers prefer to intervene at this stage by inoculating the natural must. This means they will kill the wild and sometimes unpredictable natural yeasts and then introduce a strain of yeast of personal choosing in order to more readily predict the end result. Regardless of the chosen path, once fermentation begins, it normally continues until all of the sugar is converted to alcohol and a dry wine is produced. Fermentation can require anywhere from ten days to a month or more. The resulting level of alcohol in a wine will vary from one locale to the next, due to the total sugar content of the must. An alcohol level of 10% in cool climates versus a high of 15% in warmer areas is considered normal. Sweet wine is produced when the fermentation process stops before all of the sugar has been converted into alcohol. This is usually a conscious, intentional decision on the part of the winemaker. Once fermentation is completed, the clarification process begins. 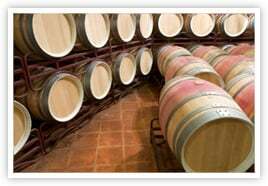 Winemakers have the option of racking or siphoning their wines from one tank or barrel to the next in the hope of leaving the precipitates and solids called pomace in the bottom of the fermenting tank. Filtering and fining may also be done at this stage. Filtration can be done with everything from a course filter that catches only large solids to a sterile filter pad that strips wine of all life. Fining occurs when substances are added to a wine to clarify them. Often, winemakers will add egg whites, clay, or other compounds to wine that will help precipitate dead yeast cells and other solids out of a wine. These substances adhere to the unwanted solids and force them to the bottom of the tank. The clarified wine is then racked into another vessel, where it is ready for bottling or further aging. 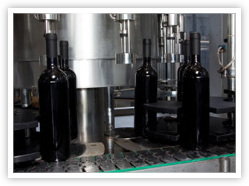 The final stage of the wine making process involves the aging and bottling of wine. After clarification, the winemaker has the choice of bottling a wine immediately, which is the case for Beaujolais Nouveau, or he or she can give a wine additional aging as in the case of Grand Cru Bordeaux and great Napa Valley Cabernet Sauvignon. Further aging can be done in bottle, stainless steel or ceramic tanks, large wooden ovals, or small barrels, commonly called barriques. The choices and techniques employed in this final stage of the process are nearly endless, as are the end results. However, the common result in all cases is wine. Enjoy! 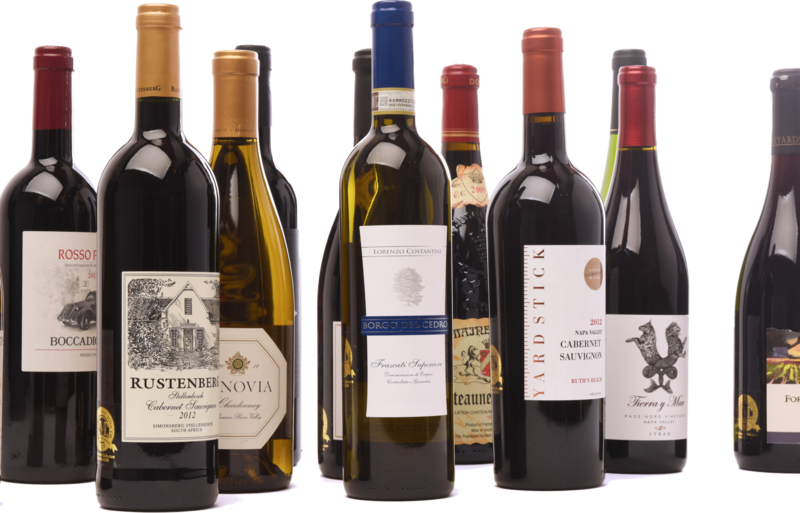 Giving the Gift of a Wine Club Membership is Easy, Affordable and Memorable. 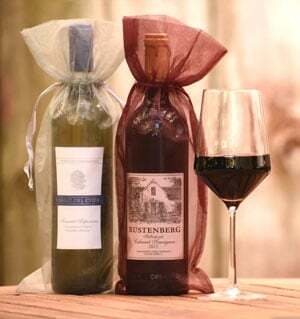 Choose from four unique wine clubs to find a truly memorable gift that will be appreciated long after the first shipment arrives, and send a customized gift announcement. We’ll do the rest.